We arrived at the trailhead in Vail at about 8:45am. We had decided that we'd distribute the food between all 12 hikers there, rather than the night before. With Tory's expert food division skill (plus the assistance of a portable luggage scale), the food was (sort of) equally divided amongst the group. Some of the men had packs up to 48 lbs (with snowshoes attached), but that was on the extreme end. With the group loaded up, we hit the trail about 9:30am. It was a beautiful sunny day in Vail with temps probably in the low 40s, so most people started with their jackets stowed. There hadn't been any fresh snow in a few days, so the trail was extremely well packed; the snowshoes stayed stowed for everyone. In fact, with the exception of one spot, the entire track along the road didn't require snow shoes at all, and so we didn't don them until we broke from the road. About an hour after leaving, we reached the critical junction where the trail left the jeep road. Of course, only the rear four in our group actually noticed the small blue diamond on the spruce tree off the road, so someone had to run up to catch the rest of the group and turn them around. The road had far more tracks on it, so the turnoff was incredibly easy to miss. 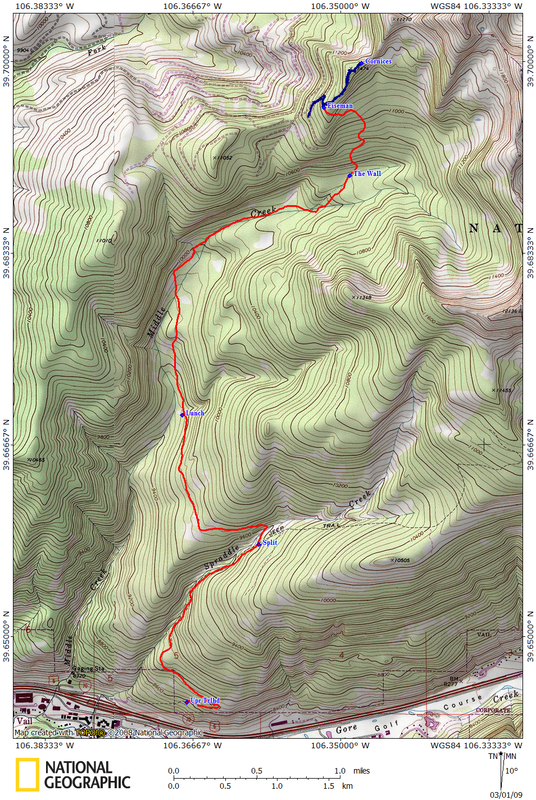 According to my GPS, it was about 1.7 miles up the trail, and, at least when we did it in 2009, there was a bowed aspen tree over the trail just before the turn off. The turnoff takes you down to cross the creek and immediately starts to climb up a steep aspen covered hill side. Thankfully, the leaders of our pack that missed the turn were easily able to hike down the hillside from the road - but had they gone farther, they would have been widely off course. Once we left the road, all of us put on our snowshoes as the trail was far less packed. It was about 11am once we all regrouped at the bottom of the valley and we started to head up the hillside. The hill had direct southern exposure, and so the snow was soft and slippery. Additionally, there was no real "shelf" for the trail to rest on, despite frequent blue diamonds the aspens to mark where the trail was. Without a level trail, climbing the snow was very challenging. I was very thankful to have higher end snowshoes with additional side crampons to prevent slipping. Those with fewer crampons struggled quite a bit to get up this slope. We passed some descending skiers and snowshoers who had stayed at Eiseman the night before. Most of the skiers were using AT gear and still had their skins on to help them control their descent on the rotten snow. Thankfully, the hill climb was only 200 feet up in about 0.25 miles. At the top, the trail completely changed character by turning north into the evergreen forest and started to lose altitude. Occasionally, the trail would pop out into open clearings granting views of the Vail ski area and Mount of the Holy Cross. We stopped for lunch a little after noon in one of the clearings about three miles up the trail, at the end of the descent portion of the trail. After lunch, the trail began to climb again, not relenting until we reached the hut. The climbs went from steep and painful to long and tedious. The trail was easy to follow due to the ski tracks of the previous climbers and the blue diamonds were very frequent along the trail. For reasons unclear to me, the trail seemed to bob and weave in between and just beneath trees. I found myself ducking quite a few times and scraping branches with my pack (which then dropped pine needles down the back of my shirt). The trail climbed steadily at an average grade of 9% until we reached what one of the descending skiers described as "The Wall," which we reached around 2:00pm. We'd all observed that, on the map, the last 700 feet of elevation gain all happened in the last 0.75 miles - the wall signaled the beginning of that ascend. From The Wall on, it was a 20% grade, occasionally spaced out with some level terrain. The Wall ended up being a clearing on a hill with about a 30% grade and no clear switchbacks. The snow was in the sun and had been heavily skied, so it was sort of crusty. Rather than trying to maneuver a switchback motion up such a steep climb, I opted to use the heel risers on my snowshoes and just plow straight up the hillside. With the risers, it actually made the climb relatively palatable, despite the thin air at 10,500 ft and burning legs. At the top, the trail turned into the forest and leveled off for a few hundred feet before it hit the next climb. The trail continued this way, seemingly endlessly, with steep climbs mixed in with level terrain. My GPS indicated we were less than a quarter of a mile from the hut, and yet we kept climbing. Just before reaching the hut, the trail traversed a steep hillside in the trees before finally popping you up on the ridge - the first sight we saw was the solar panel on the roof. When I saw it, I let out a little yelp of glee - mostly so my compatriots farther back on the trail knew that their salvation was shortly at hand. I arrived second at the hut at 3pm, behind Rurik, with Lonny close behind me. We were pleasantly surprised at the amenities that Eiseman had to offer: effectively two full kitchens (two burner sets, two sinks, lots of cookware), a huge main room, a huge sleeping room, and two - yes, count them two - outhouses (well, one building but two...um...holes). To top it off, the outhouses had no odor to them! Talk about luxury! The rest of the group staggered in over the next hour and a half, with the last arrivers showing up at 4:30pm, making the hike anywhere from 5.5 to 7 hours. The hour and a half difference is quite telling of the brutality at the end of the trail - the group was all together at lunch. Everyone was thrilled to be at the hut. The clouds had rolled in, blocking the view of the high peaks to the south and cooling off the hut. We had the treat of Cincinnati chili the first night, thanks to our Ohio-an on the trip, followed by a fruit cobbler dessert. We awoke on the second day to a dreary, snowy morning. The temperature wasn't too bad: 20 degrees, but the visibility was poor and the snow doused many of our ambitions to go out and explore (plus, we couldn't see the great view we'd read about). Eventually, after lounging around for most of the morning playing poker and eating pancakes, Lonny and I went out exploring. We decided to explore up the ridge a bit, as both of us were wary to deviate far from the relative avalanche safety of the ridge. It was clear that the snow had dropped about 6 fresh inches on top of the loose powder above the hut. We hiked up to the small peak above the hut, Pt. 11,474, but the view was extremely limited due to the weather. We pressed on a little ways up the ridge towards Pt. 11,770 but our path was quickly blocked by towering, 20 foot high cornices with no safe traverse around. Rather than risk triggering a slide, we decided to turn around and explore the jeep trail below the hut. We descended down the road about half a mile through loose trees that would offer terrific skiing (next time...) before heading back, completely soaked from the snow. Other adventurous souls utilized the giant snow shovels to form a sled run to some success. Everyone else just hung out in the hut, doing Sudoku, poker, scrabble, and napping. Dinner was some incredibly tasty steak made by Susan but which the name eludes me. Dessert was an angel food cake with chocolate pudding and toffee chips. I think I gained weight on the hike. There was trepidation about the hike out. A number of hikers in our group had gone to Benedict Hut last year and got 22" of snow dumped on them while there, making the hike out very tough to navigate and very slow going. Our guess was that we received about a foot of snow while in the hut, and it was still coming down on Tuesday morning when we awoke. After cleaning up the hut and gathering our gear together, the clouds started to break a little and the sun started peeking out of the clouds. This encouraged us, as it least it'd be sunny and not snowy for the hike out. We left the hut at 9am, struggling at first to find the trail, however it was very clear that the blue diamonds were VERY frequent and it made navigation a breeze. Given that the start of the descent was so steep, the fresh snow actually made the descent a lot of fun! Rather than trying to dig crampons into an icy and packed slope, you could just sort of "fluff" down the hill. Of course, there was a good bit of falling by mis-fluffs...and it's not the falling that's a problem, it's the getting up afterwards that's problematic! We reached The Wall by 9:30am. On our way up, Lonny and I were trying to determine the best way down this steep slope with its packed and icy condition at the time, but with a foot of fresh snow, descending it was a sheer joy. Of course, there a few face-plants, but that just made the whole thing funnier! As we descended lower and the day warmed, the consistency of the snow changed from soft powder to more spring-like snow, very soft and wet. The change in consistency made hiking a bit challenging, as the snow got much heavier and began to stick to our snowshoes. Once past our original lunch spot from the hike in, we had 300 feet of elevation to gain, slowly, through the forest. Once at the top, we all stopped to knock the snow off our snowshoes. We reached the steep aspen hill just before noon. By now, the day had warmed the snow significantly - it wasn't the icy snow from the hike up, now it was considerably softer and slipperier. On three different occasions, my snowshoes punched through the snow, making the descent even harder. Despite the extra crampons on my shoes, my feet still tended to slide downhill, making the descent quite challenging. Once down the hill, the worst was behind us. We rejoined the road and followed it back to the trailhead, arriving at about 12:30pm.